Lion and Tiger Stencils - Oh My! Tiger Stencils - like tigers - can be big, hairy and scary or cute and lovable! The one in this project is of the lovable variety. Decorating for children is so much fun. It gives us an opportunity to do more than design – we get the chance to create a fantasy! A neighborhood Nursery School asked me to add some animal images to their small classroom. They wanted pictures to help teach and stimulate the little minds. 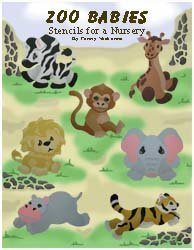 Taking into account the sky blue walls and the flower border used as a chair rail molding, I decided that the Zoo Babies Wall Stencils would be the perfect match. The colors of the animals in this collection compliment the wall and border colors. Always think about the background and adjacent colors when choosing your stencil designs. If they don’t work together your whole project can turn out as an eye sore instead of the stencil art you had in mind. We have a detailed article about working with colors in your stencil art, so for more on this go to the Color Stenciling Technique. The images needed were small enough that we were able to tape the stencils directly to the wall and apply paint. Painting on a vertical surface can be a bit of a challenge so make sure that you don’t overload your brush with paint. This will cause the paint to drip and run. If you need more information on basic techniques, go to How To Stencil. These are multiple layer stencils, which help us achieve an image with more detail. These designs close in the usual gaps and spaces between the colored islands. They are not difficult to use and well worth the effort. For more information on how these stencil designs work, go to Stencil Patterns. Here is a close up view from one of the tiger stencils. I deleted the background so that you can get a good idea of how the colors on this image work together. Notice the details? Do you see the shadowing effect? It’s subtle, but really ads life to the image. For more on the techniques to produce this effect, go to Stenciling with Some New Twists. How do you like those puppy-dog eyes? There are a couple of ways for you to achieve that in your stencil art. You’ll find those ideas at Tips for Stenciling Eyes. If this project interests you, don’t miss this great video on working with Wall Stencils. The book below includes the lovable tiger stencils that we featured in this project. Each book will come to you as a downloadable pdf file in your e-mail. Just check your e-mail after purchase for the link to connect to your file and print or save. It's that easy! 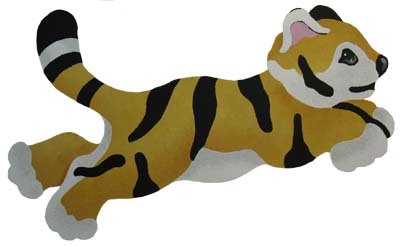 If you are looking for more realistic tiger stencils, you can find this one at The Stencil Library. Just follow the link by clicking on the image below. Return to Home Page from Tiger Stencils. Return to Stenciling Ideas from Tiger Stencils.